Will a child be next? It's not easy being an animal control officer. You see people and animals at their very worse, and the job too often puts you in direct conflict with people who are emotionally volatile. That said, the job does require officers, at times, to step up and safeguard the public from dangerous animals. Sadly, not every Animal Control officer is competent do the job. Consider the situation in Aiken, South Carolina, where a group of free running molosser dogs (pit bull-boxer crosses) recently attacked and killed two miniature ponies, a goat, and perhaps a cat (it was never seen again). The dog's tracks were all over the crime scene, the dogs were photographed with blood smeared across their bodies, and the bite marks on the goat and horse made clear this was a large-dog attack. So what did Aiken Animal Control do? They said "maybe it was coyotes". Who knew? They did not have the equipment or budget to test. The latest is that the animals are to be "adopted out of state." It means out of sight is out of mind. In these kinds of situations, vicious dogs are routinely moved out of state, their histories scrubbed, and then the dogs are re-homed with unsuspecting and naive wanna-be dog owners who too often learn the hard way that a large, poorly socialized, dog can be a dangerous liability on four legs. Will that happen in this case? It looks like it. The dogs have been separated and, unless they attack other dogs or their human handlers in the next few weeks, they are are scheduled to be sent to "no kill' shelters in another state. Aiken County Administrator Clay Killian says the dogs will NOT go to the adoption floor at the Aiken County Animal Shelter. Right. Why not? Oh, because they are DANGEROUS DOGS? Got it! Aiken County Administrator Clay Killian says the dogs will not be adopted into the same home together, and that a "history" of the dogs "possible" involvement in an animal attack will be included in their adoption information. Wanna bet that never happens, or that that the "history" includes no photographs, and is so glossed over and sanitized as to be a lie? And if the dogs attack again, where will be Aiken County officials be? Cloud-hidden, whereabouts unknown, you can be sure. None of this is to say that these kind of cases are easy. However, it goes, the ultimate price is too often paid by the dogs who, through no fault of their own, were born big with prey drive and who got little training or socialization. Add in a human family that did not properly fence or kennel them, and it's a predictable tragedy. To be clear, all of this was preventable. Neighboring farms had seen these dogs loose and harassing livestock before, and they had reported the dogs to Animal Control. And what did Animal Control do? Little or nothing. What is Aiken County Administrator Clay Killian going to do about THAT? It's a serious question as, at some point, liability is going to visit his door for failing to act. It's not like the situation has not made the newspaper! And what about the Court? Will it step in and ban these dog owners from ever having dogs again? We'll see; additional charges are set for March 25th. People have to carry guns now to protect themselves from dogs. Too bad the farmers didn't take care of the problem dogs when it first happened. 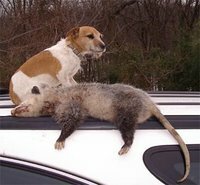 Many states allow shooting of at-large dogsthtat threaten livestock. I heard that this family's dog just another another litter of the same type of puppies. "None of this is to say that these kind of cases are easy. However, it goes, the ultimate price is too often paid by the dogs who, through no fault of their own, were born big with prey drive and who got little little training or socialization. Add in a human family that did not properly fence or kennel them, and it's a predictable tragedy." so tired of all these types of dogs doing what they are bred to do and their owners not taking responsibility .... when will the victims find justice? Rural animal controls everywhere are poorly funded and overwhelmed. Most locals take matters into their own hands, hence, SSS, And euthanizing problems dogs is the best answer. I suspect the responsibility has been in the hands of stock owners for centuries, if not millenia. It's not cheap to patrol a big landscape and the dogs are likely gone when animal patrol shows up. humans are the problem here. great fences when one has dogs are essential and non-negotiable. i just want to point out too, that the issue is not really the breed here. in my experience as a rancher, vet, and trainer, most dogs (of any breed), who are not trained to stay off livestock, will chase and kill sheep. in my experience, dogs are far more of a problem than coyotes, wolves, and lions. most medium and large breeds can and do kill livestock without a problem. what is even more difficult about this kind of situation, is that most of the time, dogs kill for sport almost--they just run and kill everything they can. at least wild predators usually kill what they will eat at one time. The important point here is that ALL dogs, but especially **motivated dogs**like these should be trained, and ONLY end up with knowledgeable, responsible owners, who know how to set limits and how to train effectively. Thanks for writing this great article about the loss of my animals. Today they decides the animals will be adopted out of state and allowed to live on. No justice for my animals. Move on to the next kill and the owners get to keep 2 other dogs, which atleast one is a pitt.